Cosmetic Injections can cause a bruise, no matter how careful or experienced a physician is. Why? Because until now there was never a way to see “beneath the skin” to avoid nipping a blood vessel. The face is incredibly vascular – that’s the primary reason the face bruises so easily. When we can see the vessels and and avoid them, the potential for that accidental bruise goes WAY down. Before AccuVein, any injector was essentially operating blind – and even with precision knowledge of facial vein anatomy, every single person’s vein map is different. Hemoglobin in the blood absorbs infrared light. When the device is held above the skin, veins appear noticeably different than the surrounding tissue. The vasculature shows up clearly on the skin’s surface, aiding in vein location for access and avoidance. Does using the AccuVein interfere with my treatment? Absolutely not. The device never touches your skin. Our medical assistant simply focuses the beam on the area to be injected and the veins instantly and clearly become obvious. 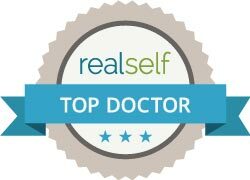 Dr. Kim has been using microcannulas for placing most fillers for years. MicroCannulas allow for a single port instead of multiple needle sticks. The smooth round tip of the cannula pushes veins out of the way. The AccuVein allows her to see the veins before even making the initial opening for the cannula. Combined, the cannula and vein illumination provide the best opportunity for a “no bruise” injection procedure that exists!